Ridgeway’s permanent cat ladder system’s design is safe and simple and offers individual parts which bolt together and form a complete ladder. We keep parts in stock to ensure quick delivery or they can be supplied as a complete ladder kit once the floor-to-floor dimension is given. 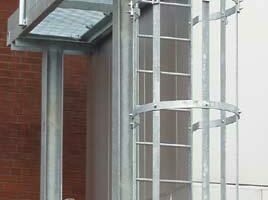 Ridgeway’s cat ladder system tries to eliminate the need for expensive site surveys and preparation of detailed drawings, which add to delivery time. The unique design and production of cat ladder components are BS compatible. Cat ladders are usually available “off the shelf” and are so flexible. It will solve virtually any access problem. Cat ladders are straightforward to install. GRP, stainless steel, galvanised steel and aluminium. Supplied in “flat-pack” form for ease of transportation thus lending itself to export projects.